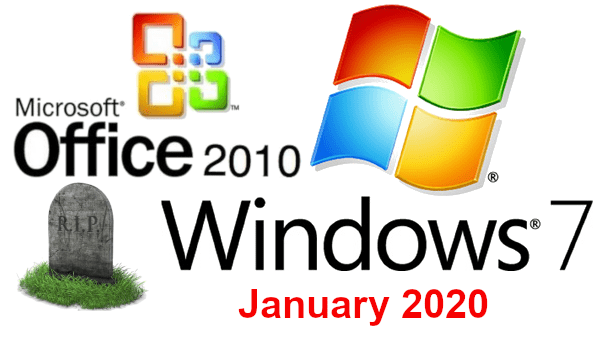 Users of Windows 7 operating system (Home or Pro) have less than 12 months to upgrade to Windows 10 as no further security updates or bug fixes will be issued by Microsoft* beyond January 2020. *Exception if you are a large corporation or enterprise and willing to pay to end support. The same also goes for Office 2010 which needs to be upgraded to Office 365 or Office 2019 before January 2020 and Microsoft Server 2008. Windows 10 has matured a great deal since it was first launched back in 2015 and is now far more reliable, secure and robust that its older counterpart. The IT Guys and Hybrid ICT recommending upgrading as soon as possible. Because Windows 7 has been around since 2009, it has become the mainstay of many computer users, especially Businesses. Many businesses rely on computer software that will ONLY work on Windows 7 (Accounting, Invoicing, Stock Control software etc). Before considering any of the following upgrade options, examine your computers and servers and identify your critical applications. Check with the software manufacturer, if those programs will run on Windows 10 and if so, what is required to make the upgrade. The IT Guys and Hybrid ICT are available to assist you in upgrading critical software products should you requires some technical assistance. If your critical software cannot be upgraded to run natively on Windows 10, there are a number of ways that you can still run programs in Windows 7 even though computers are running Windows 10. Contact Us for details and a price estimate. Purchase Windows 10 and upgrade your existing Windows 7 computer. Subscribe to Microsoft 365 Business and get a FREE upgrade to Windows 10 Pro, Office 365 and Exchange Online mailbox. Upgrading an old server may not be economical, the options available including the purchase of a new server, replacing the server with a NAS drive or moving data and functionality to the cloud. Contact Us to arrange a consultation and a site audit.